"Look at you! You're as filthy as a pig in a pen!" 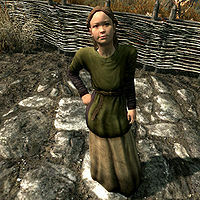 Britte is a Nord child living in Rorikstead with her father Lemkil and her twin sister Sissel. 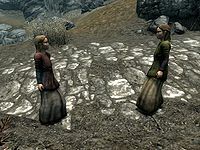 The family is rather dysfunctional, and a frustrated Lemkil makes no attempt to hide his disdain for his children, claiming that they are useless farmers, as well as blaming them for his late wife's untimely death during labor. Britte, in turn, takes out her hatred on the meek and unfortunate Sissel. Britte wakes up every morning at 6am and leaves the house. She then proceeds to spend twelve solid hours chasing and harassing Sissel, until 6pm, when she returns home and stays there for the rest of the evening, going to sleep at 12am before beginning her routine again the next day. She wears a set of child's clothes with shoes. She carries the house key and a selection of food and toys. Britte: "You're going to get it, Sissel!" Sissel: "Why? What did I do?" Britte: "I told you to weed the garden by sunset, and you didn't do it. Now you're in big trouble!" Sissel: "Papa told you to do that, not me! Now leave me alone!" Britte: "Look at you! You're as filthy as a pig in a pen!" Sissel: "I am not! You're lying!" Britte: "You smell like a pig's pen, too. What a stink! Have you been rolling in the dirt all day?" Sissel: "You're a liar! I won't listen to you. Leave me alone!" This page was last modified on 27 December 2017, at 06:19.